Fuego de Guimauve, a new concept that highlights the elemental force of fire, introducing an interactive dining experience, invoking curiosity, and revisiting childhood excitement with an mature approach. Loosely based on that childhood favorite s’more, the campfire treat, but improved upon for the complex adult taste buds. 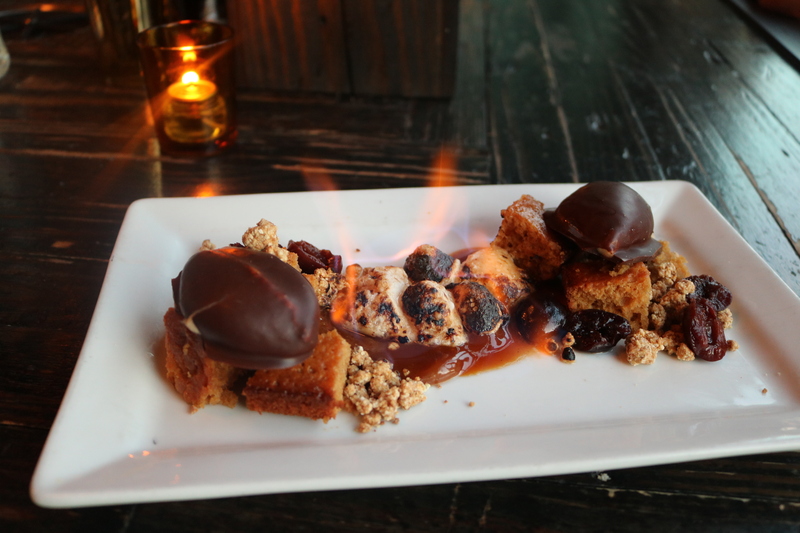 This dish is comprised of ancho marshmallow, dulce de leche cake, chocolate covered white chocolate mousse, rum cherries, milks crumb, caramel, char. The homemade guimauve (French for marshmallow) is flavored with ancho powder for a hint of robust smokiness and a touch of heat. The dulce de leche cake acts an improvement on the graham cracker flavor profile. Toasted white chocolate ganache to represent the lovely milliard reaction. The mousse quenelles are covered in dark chocolate to round out the chocolate flavor profile, and it invoke a sense of curiosity as to what is inside the chocolate wrapping. This is a play on candy bars, childhood intrigue, and adult fascination. Rum cherries to make it boozy, interesting, and fruity, and dehydrated chocolate mousse for texture. These components sit atop of caramel sauce, to add a roasted flavor, to add comfort. The marshmallow is flambéed tableside for an interactive diner experience, to have the element of fire transform the dish into some spectacular and unforgettable.